Palm Springs; the name alone makes me eager to hear more. I was there a few years ago and was amazed and excited by some of the best architecture ever. It’s heydays were the years the Rat Pack setting up shop there. They commissioned renowned architects like Albert Frey, Raymond Loewy or Richard Neutra to design their weekend retreats. But a true gem that recently hit the market suggests the 60’s saw some exiting design too. It was built by Floyd D’Angelo. Owner of the Aluminum Skylight and Specialty Corporation. For the design D’Angelo partnered up with his friend, aerospace engineer Henry Conrey. The house was built as a vacation home, and to showcase some of the products manufactured by D’Angelo’s company. It looks terribly dated inside, and lacks the usual 60’s flair. But it’s a rare find. the realtor claims it’s just one a very few fully rotating homes ever built. 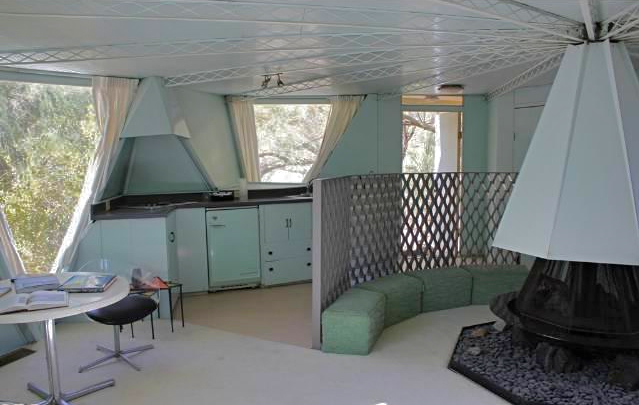 This entry was posted in Unusual homes and tagged Architecture, California, design, Loewy, Neutra, Palm Springs, Rotating home. Bookmark the permalink.